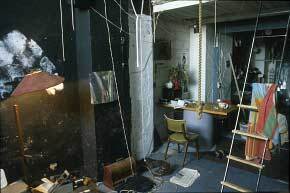 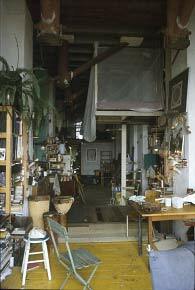 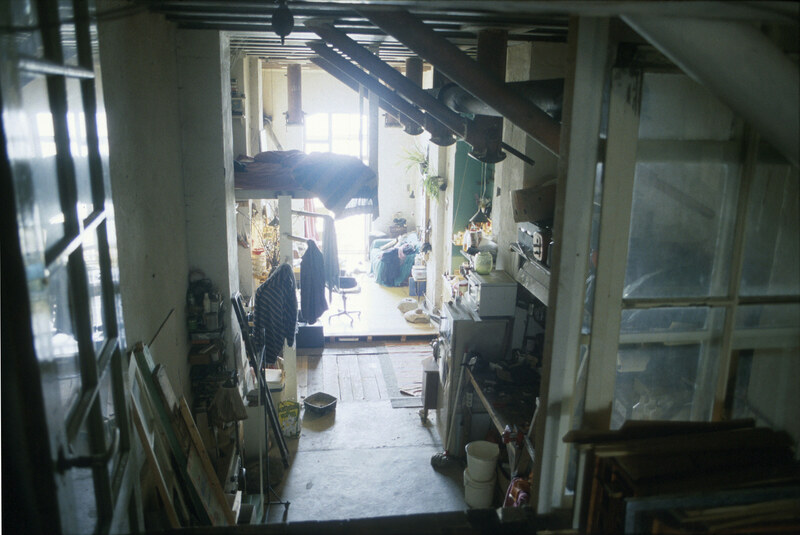 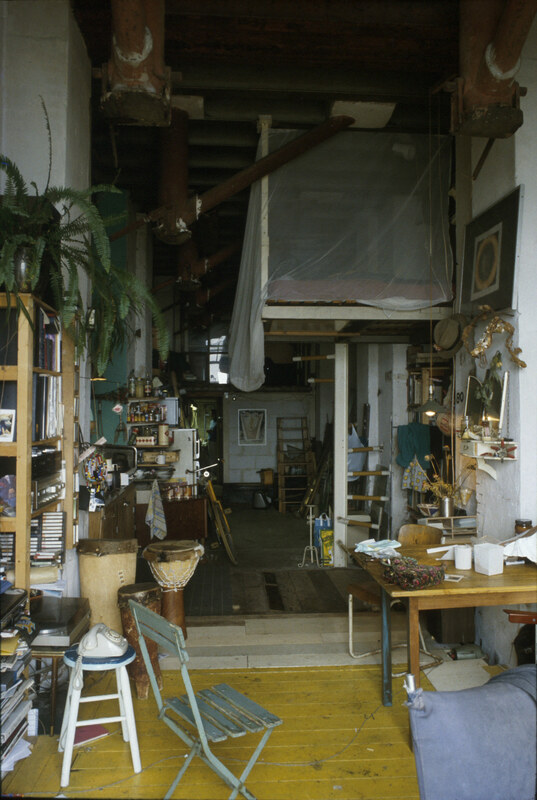 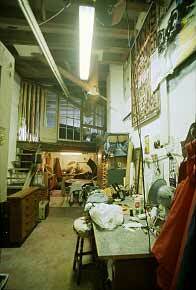 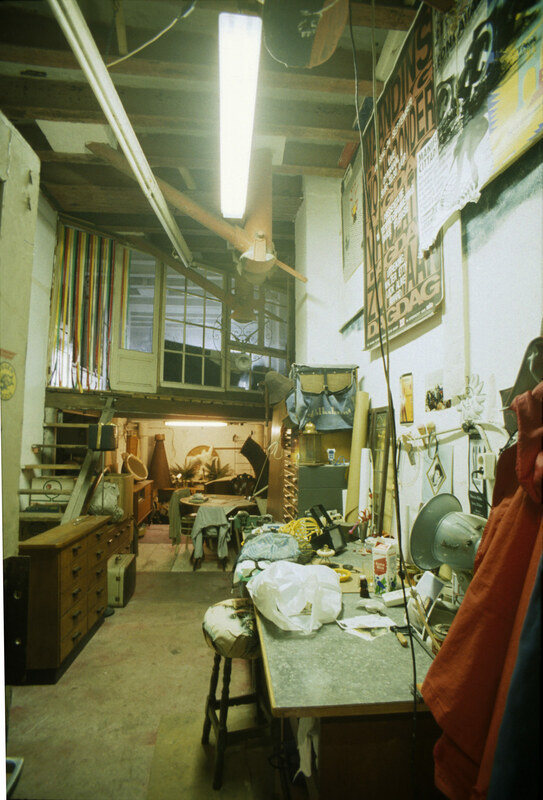 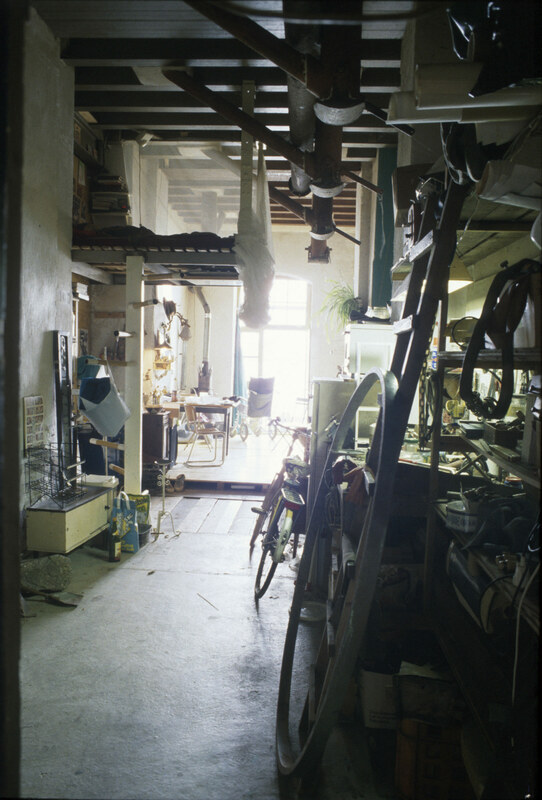 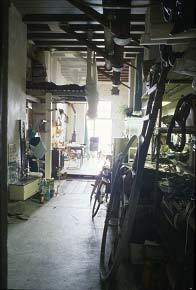 CONNIE’s is a later, one-chamber apt, which extends over the access gallery and its separate Gang jewellery-workshop as a glazed mezzanine. 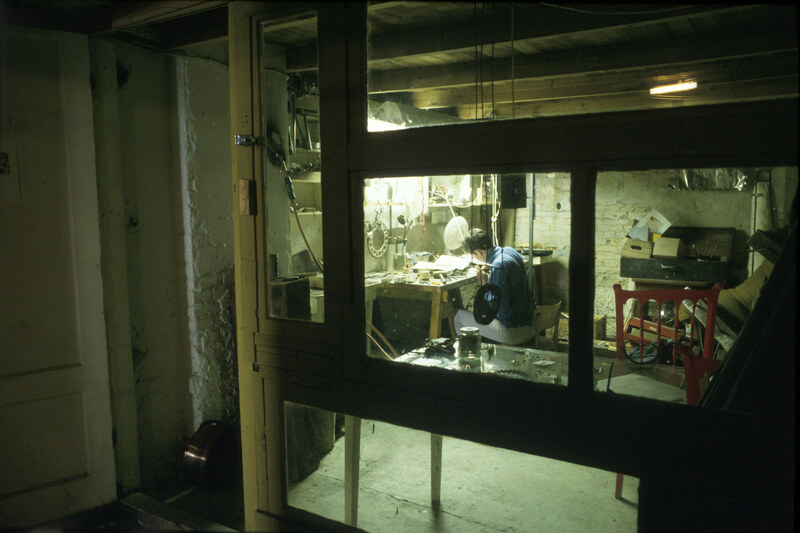 DURO's is a single chamber two-thirds-width space - rather cell-like with its single high window and no mezzanine; however its Gang store-cell opposite its facade, has been uniquely fitted with a windowed platform supporting a simple living-space (used by a guest: SIMONA). 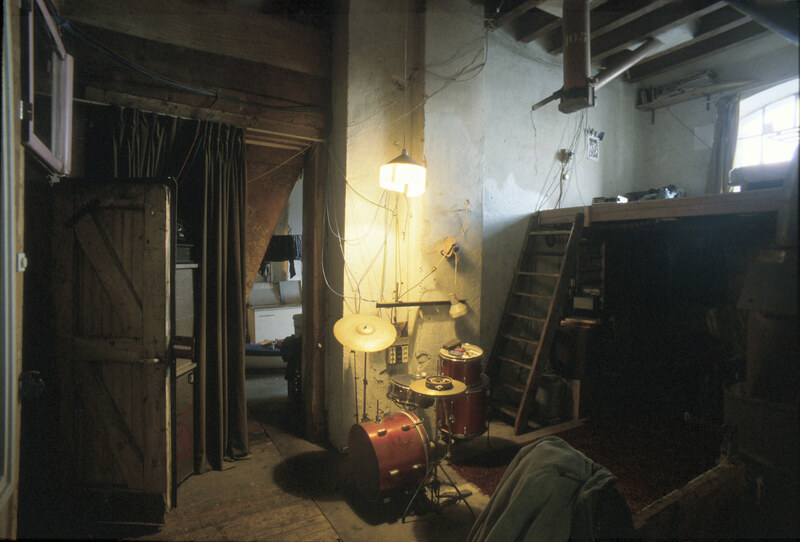 AREND’s three-chambered two-thirds-width living-space contains a complex variety of interlocking functional spaces, including a bakery and a music-studio. 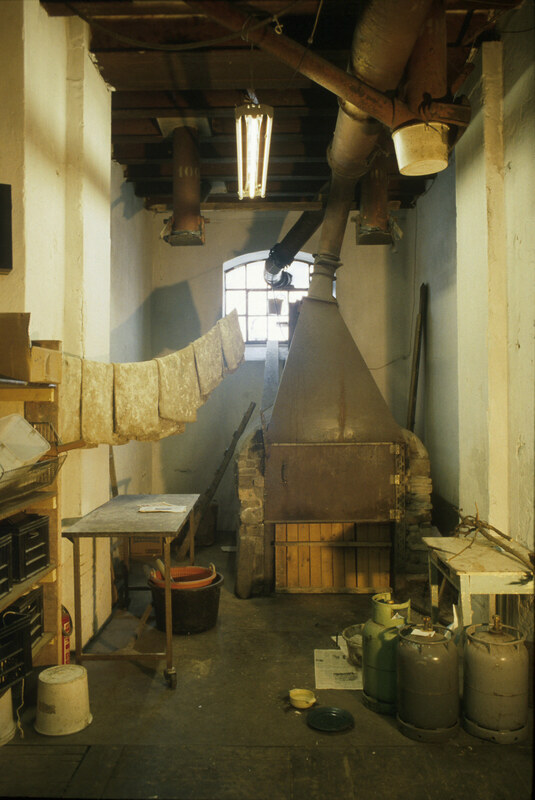 HUUB's is a single chamber two-thirds-width space with a single high window lighting a window-fronted mezzanine. Moving into the Silo already one year after the squatting Connie acquired only one of its long narrow transverse chambers. 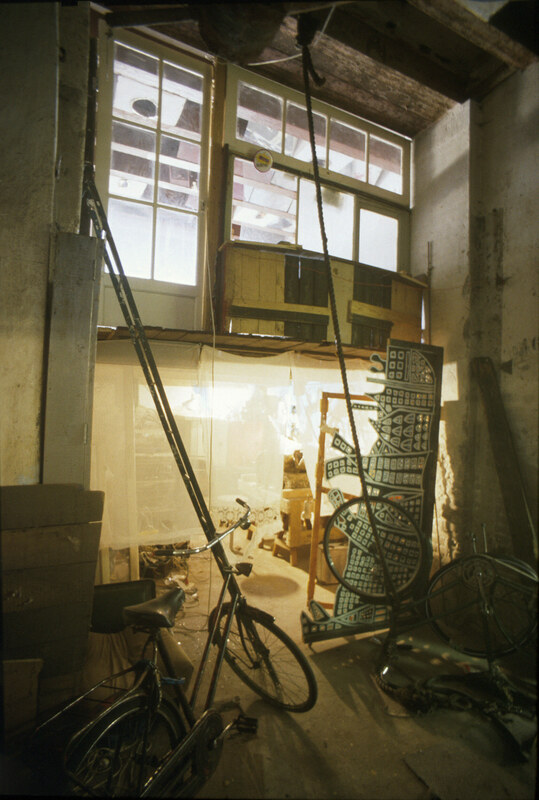 One end opens onto the quay, the other lifts as a mezzanine over the enclave’s corridor and her shop-like jewellery studio - whose glass facade faces her ‘front-door’ from across the ‘street’ of the Gang. 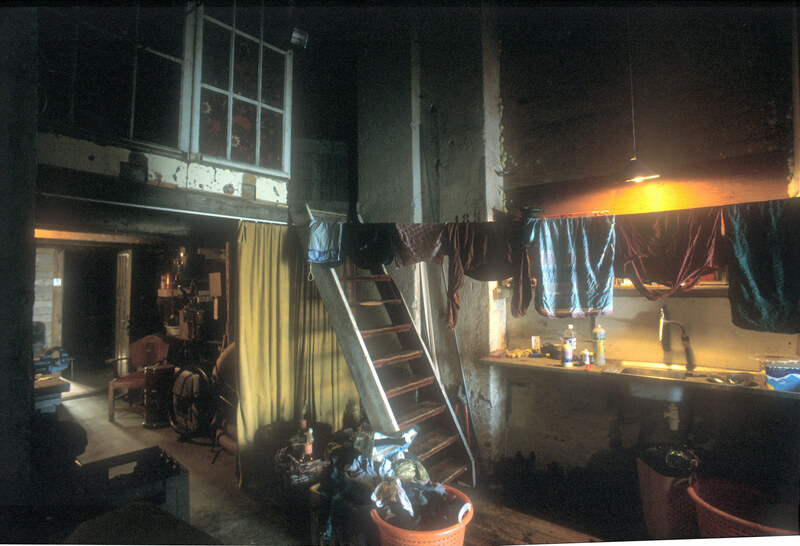 The long space accumulates leisure as it deepens: starting as a bike and (a second) jewellery work-place, changing to a kitchen and then - passing under the small bed-platform supported below the steel rafters in its steel frame - acquiring a yellow boarded floor and becoming a living room heated by a complex stove and opening through a glazed door onto its portion of Quay. 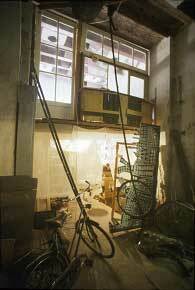 Connie and her friend Allaert designed and he welded it. 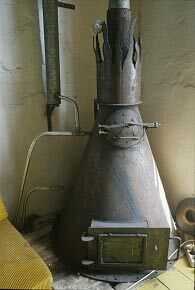 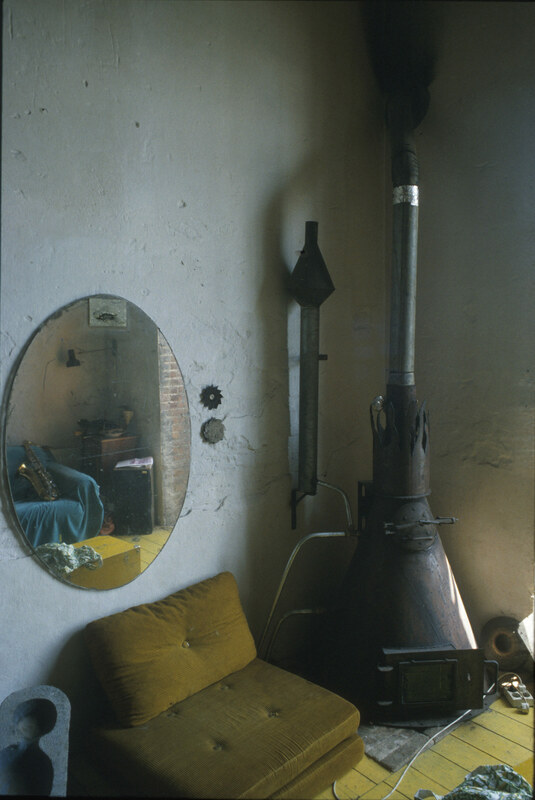 Not so much a stove as an elaborate flue which stands over its hearth like a huge candle-snuffer with an open top. 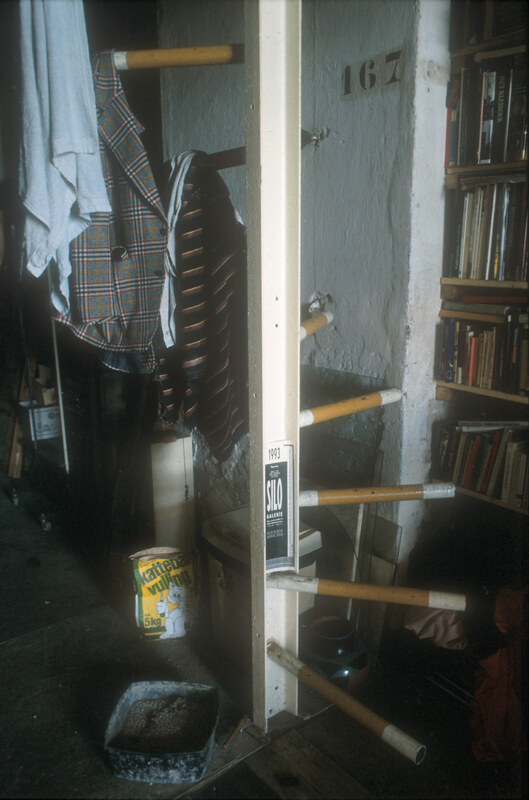 The 95cm high steel cone (outlet of some grain hopper) supports in its centre a helix of water pipes connected to an under-floor system feeding two street-scavenged radiators. The ‘expansion-tube’ rising from the hot water outlet pipe and the ‘crown-of-flames’ are Allaert’s college welding exercises. The hearth, a hollow circle of fire-bricks resting on the Silo’s concrete floor, is filled and cleaned through an added door (a common type of Silo scrap, its glass was added). 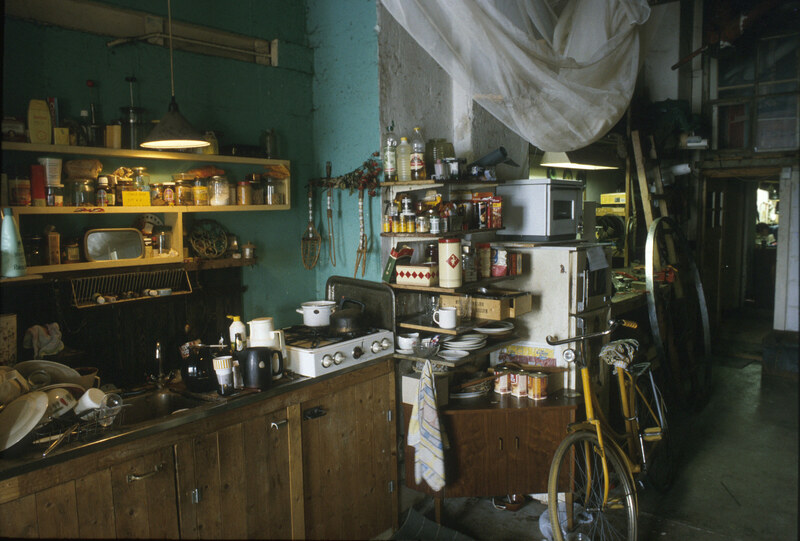 Note the exquisite silver pearl-like bike-padlock fortuitously poised between the crown’s flame-fingers ... in a context of invented objects commonplace acts and things are rich! 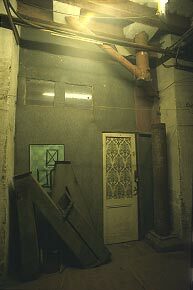 The the four large piers that frame the centre of Duro's chamber once flanked the east-side conveyor-path. 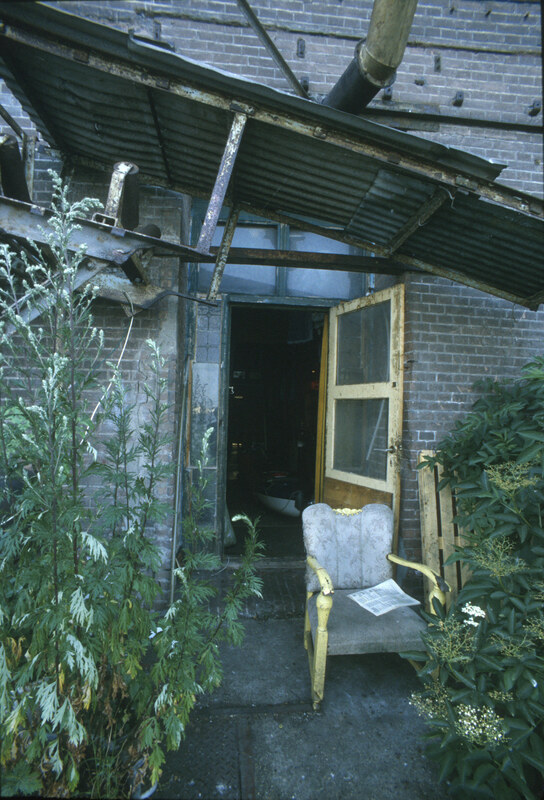 Now its once open path is closed with cement-block walls (forming alcoves for a kitchen on the north side and a table on the south), and its floor trough is surfaced with planks (and a fragment of carpet). 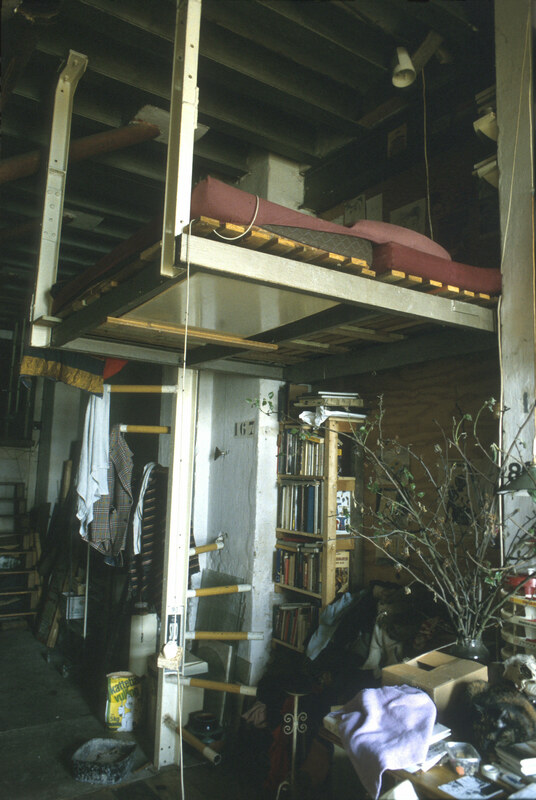 The sides of the alcoves (and of the jutting portion of the west piers) support the ends of the beams and plank that support the central bridge-like bed platform. 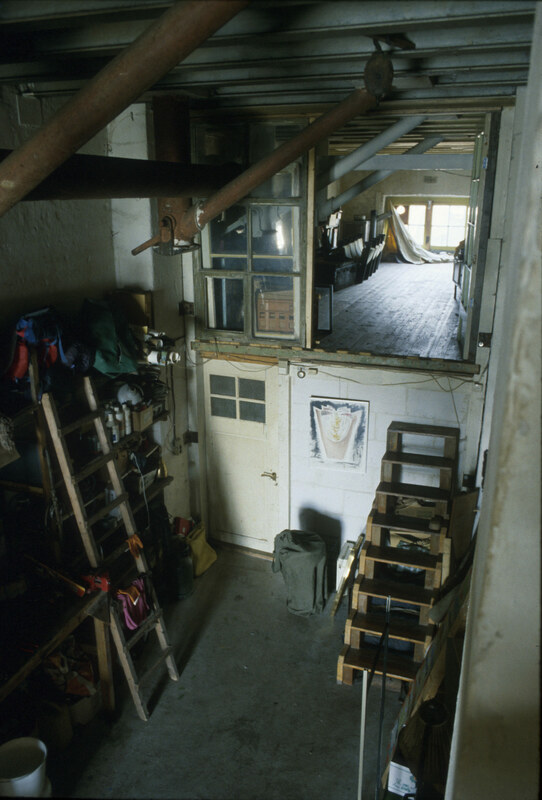 At the chamber's east end a shallow planked stage covers the concrete floor, perhaps warmer for bare feet - on it is a spare bed and the bed-platform ladder rises next to it. 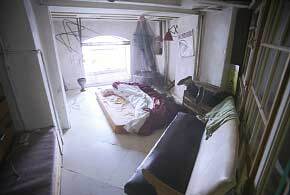 Three months the far-end bed is in a new position but very little else has changed. 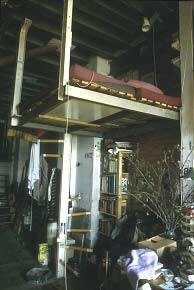 The wall-like west side of the bed-platform blocks a view of the upper space. 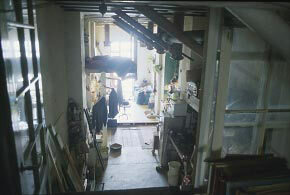 Standing on the raised floor, east of the central bed platform - on its open side. 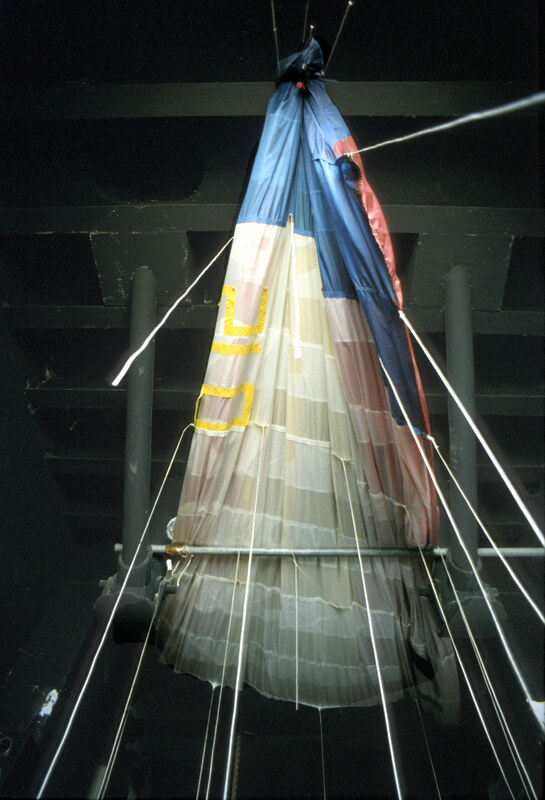 Here lines from a parachute, hung like an overhead canopy, descend like vines. 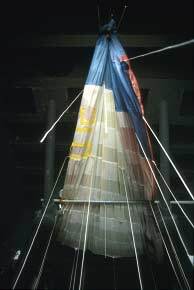 We are facing down the chamber from its east end towards the west - above us is a parachute, draped over a pole between the east-end discharge-pipes - from it hang its lines, strangely invading the upper part of the east-end space. 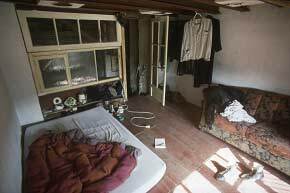 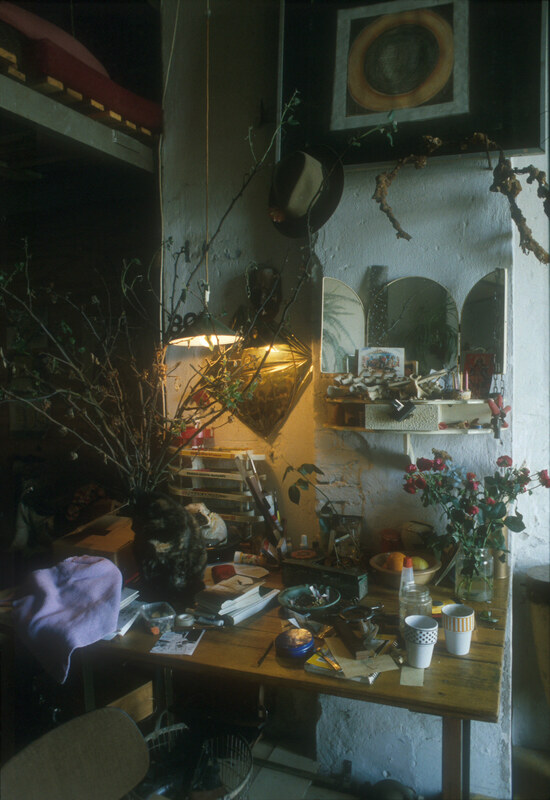 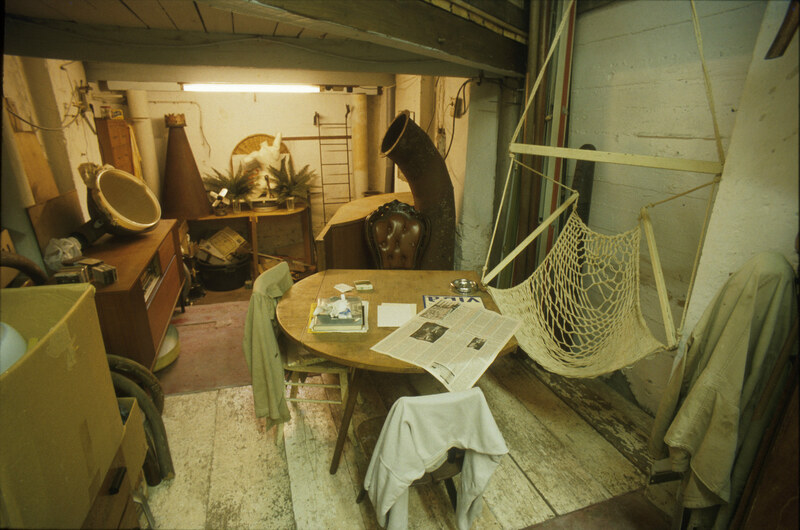 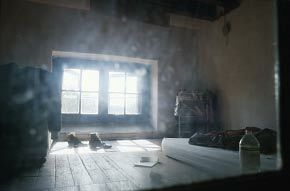 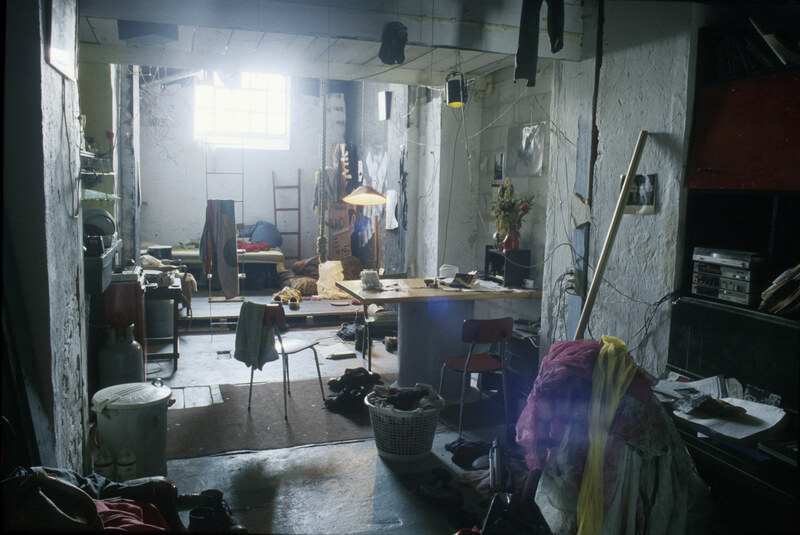 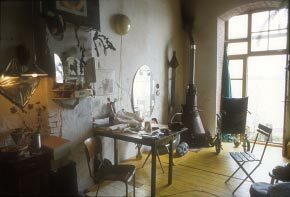 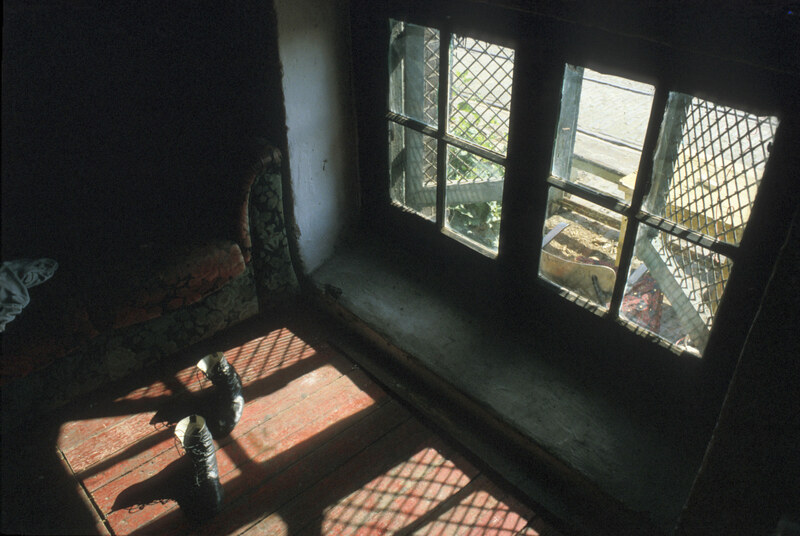 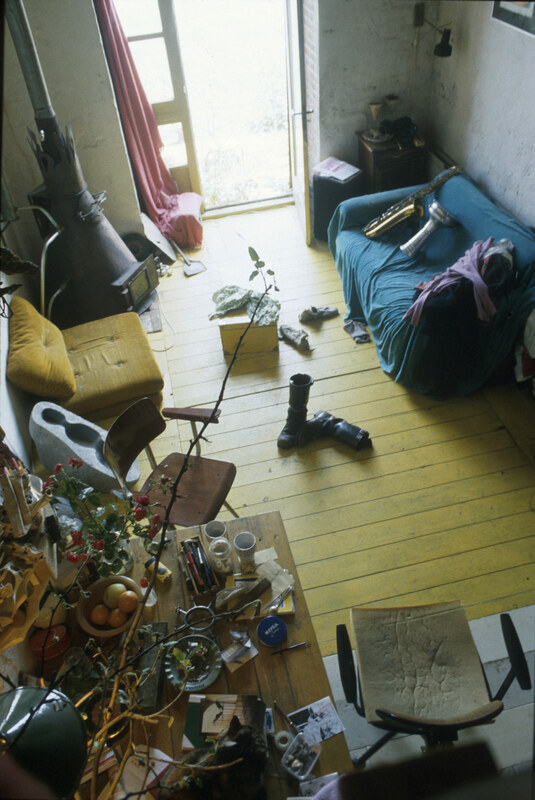 Simona Levi, a guest of Duro, built herself a minimal single room "guest-apartment" in the upper half of Duro's store - in the Gang cell opposite his living-space chamber. 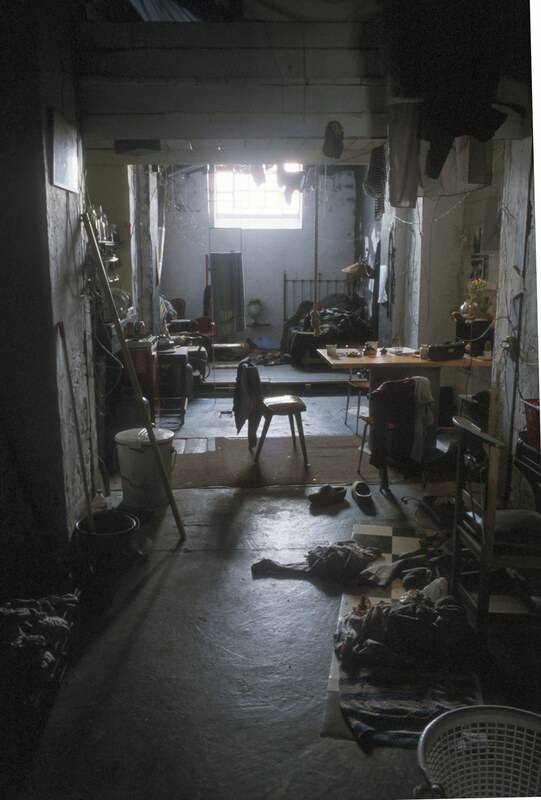 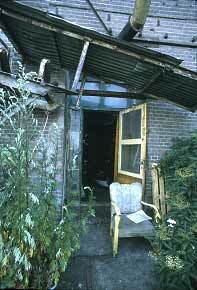 The sole use of a Gang-cell as a living space. 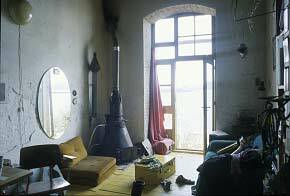 A little 'guest-apt' with no facilities beyond sleeping and sitting; accessed from the Gang up a silo ladder, through a glazed scrap-door in its scrap-windowed facade, and from the outside Dijk through its platform-level window. 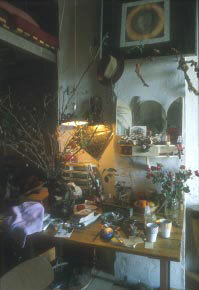 The apt was designed and built by Simona in May 1994, materials were collected 'slowly' then it was made in 4 days. 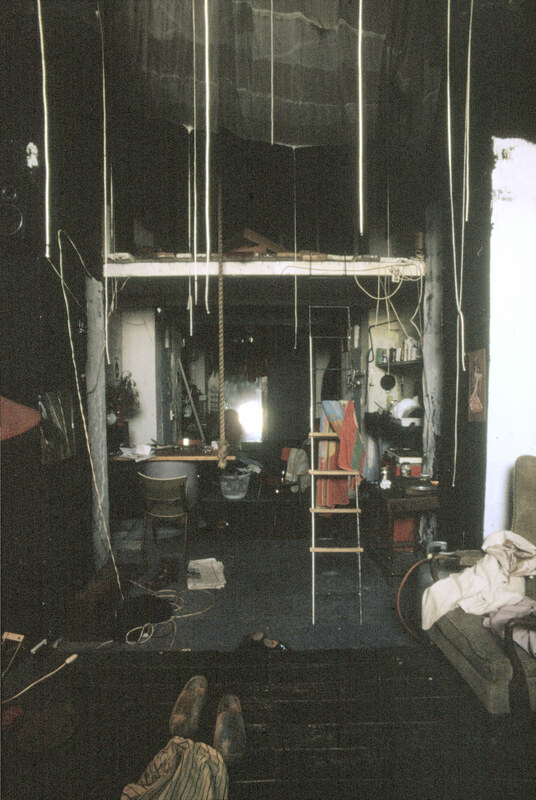 The apt required only a facade and a wooden support structure; the latter was a 'table' of 4 pillars with 2 'wall-plates' fixed to the side walls, and 3 joists across supporting the floor. 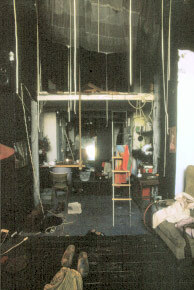 The red floor was found in 4 sections, the facade's 'balcony' projection was inherent in its shape; its curved facade wood was as-found; its door and windows were "around". 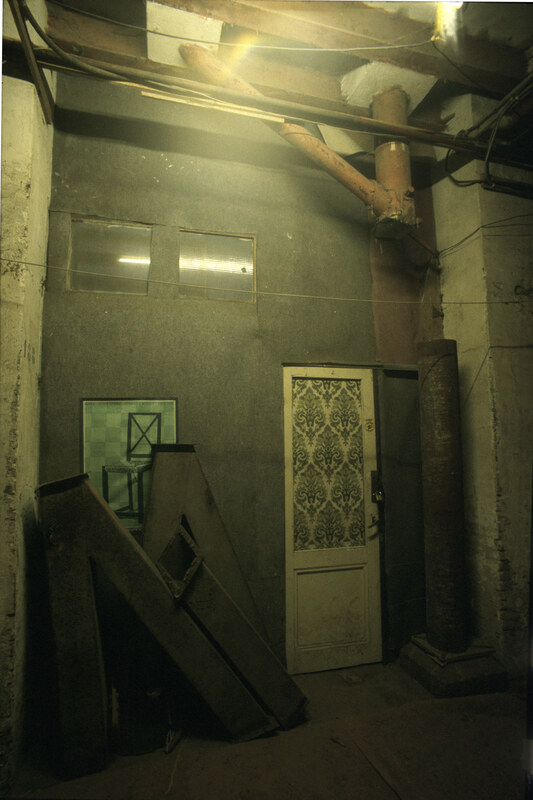 The projecting silo-pipes were cut off by Bart and sealed by Duro with "moose-spray". 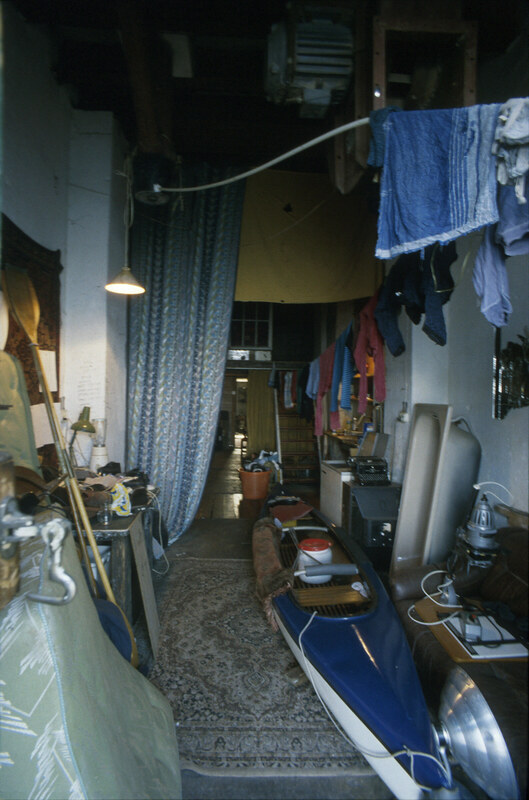 The ceiling's reflecting-plastic mirrors light into the Gang (an earlier structure in this store was disallowed as it blocked the Gang's light). 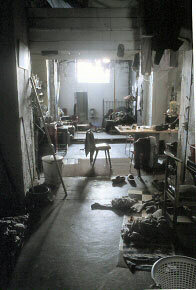 In the store beneath is staging from Duro's theatre work "Boo Ha Ha". One of Arend's three chambers is a bakery and ice-creamery with a built-in improvised oven - from here he supplies the Silo (and its visitors) with several types of bread, rolls, cakes (and wonderful ice-cream). 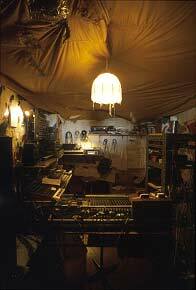 His other two chambers are a complex of interlocking spaces concerned with music production, workshop, storage and domesticity. His big living-space has three entries: a door from the Gang, his bakery 'side-door' from the open/unoccupied chamber-7, and a 'back-door' onto the Quay. 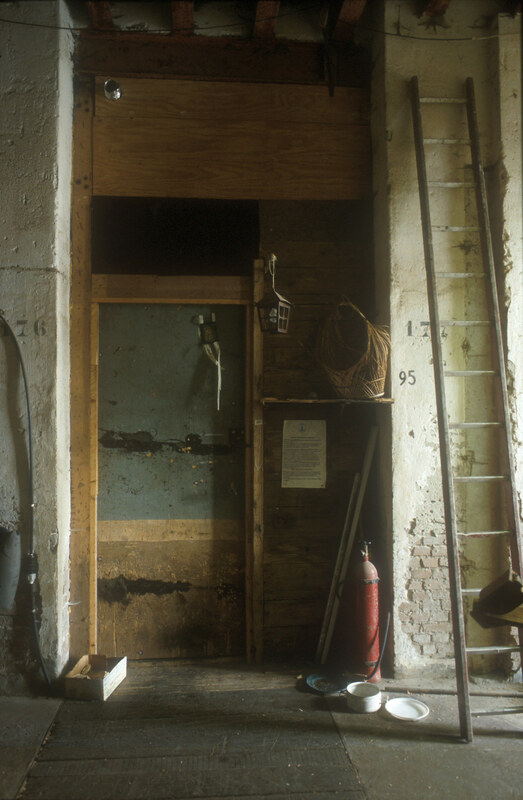 Chamber 7 is an access-way to the Quay - in the wooden wall that now fills its east conveyor opening is Arend's 'shop-door' to his bakery and icecreamery - the more 'public' of his three living-space entries. Arend's bread oven is a brick and steel construction, improvised from Silo installations. The far left door opens from the bakery into the first of the two domestic chambers, viewed here from under its east end bed platform [see pic below]. 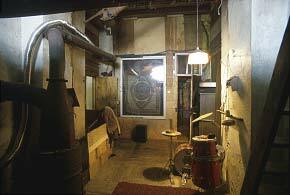 This is mainly a music-making space and facing us is the wall of an electronic music-studio. On the left is the Silo's only example of an oil-drum stove [see next pic]. The most primitive type of squat stove - an oil-drum. 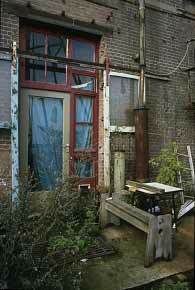 However this one has developed: fitted with a Silo inspection-door(?) 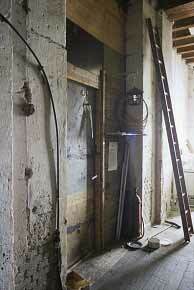 and bolted to a chimney of Silo chutes and pipes. 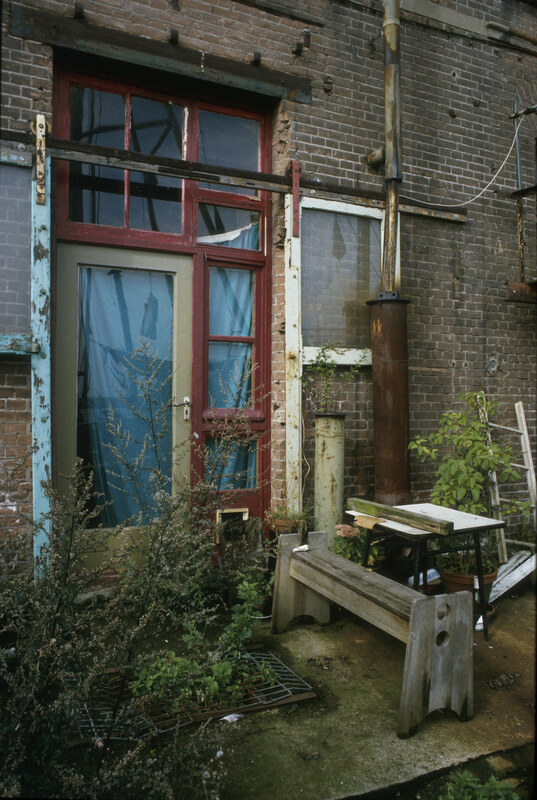 Behind it stands a little manufactured [oil?] 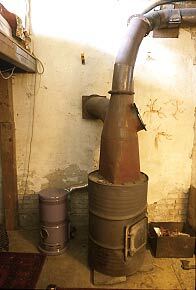 stove which drapes its chimney of scrapped air-con tubing along the big stove's rigid outlet pipe [see previous pic]. 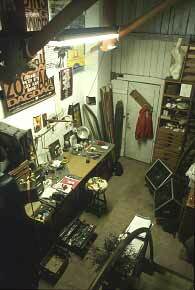 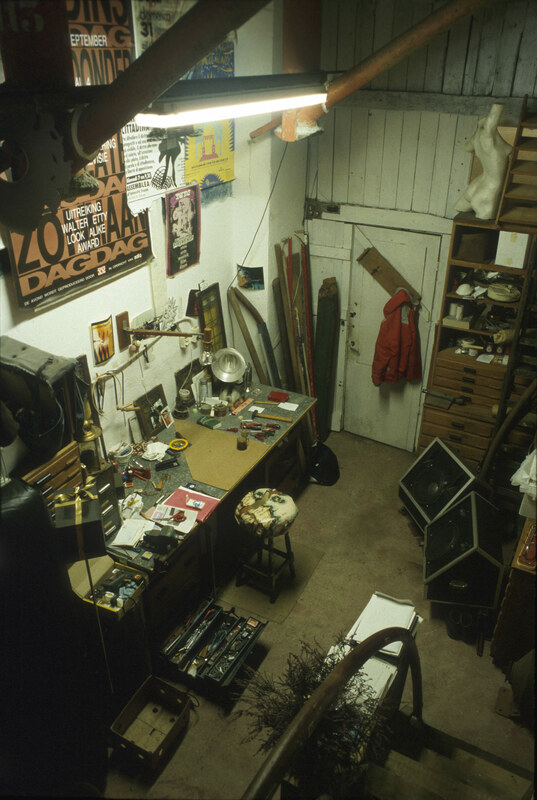 Arend's "Electronic Music Studio" was started in spring 1990. 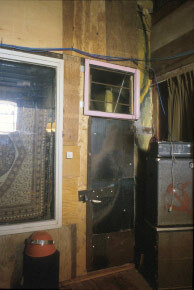 It was later walled in to exclude dust and external sounds (its window is double-glazed). 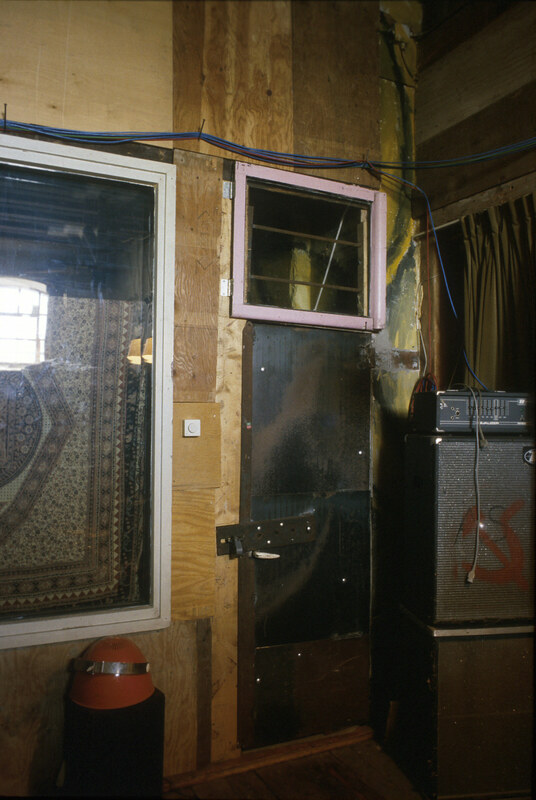 Inside the music-studio. 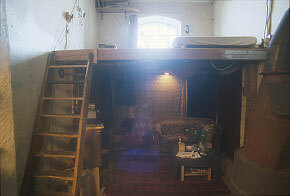 The ceiling tent catches dust and the lowered space needs less heating and helps sound quality. 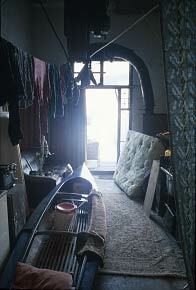 Across the chamber's windowed east end is the bed-platform; on our left the music-studio's door is open; ahead is a curtained entry to the second domestic space, chamber 10. Arend's third chamber, his second domestic space. 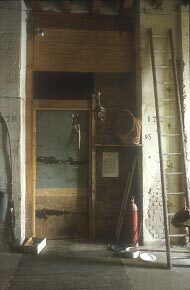 Under a glazed platform at the chamber's far end is an open door into the Gang. 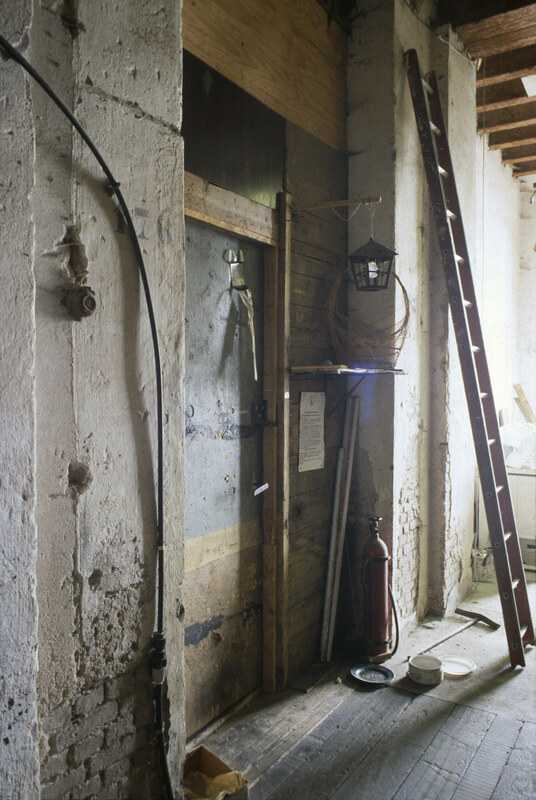 The second domestic chamber from near its Quay door. 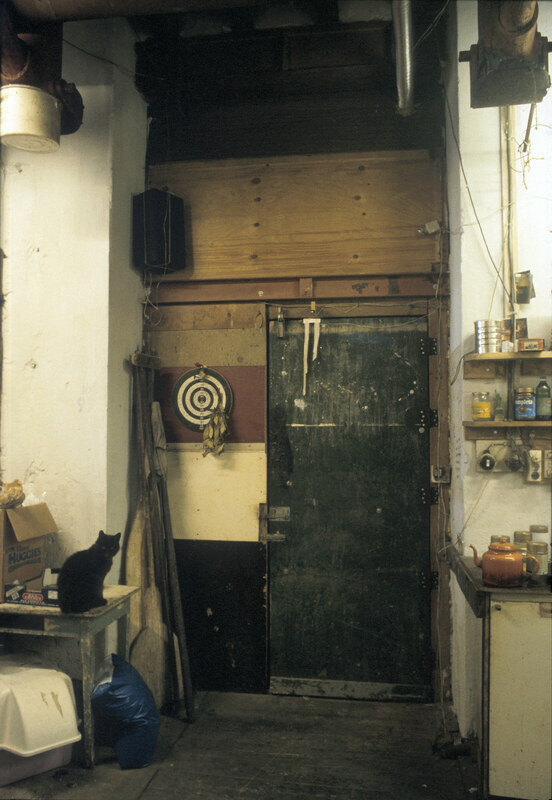 The open door at its far end reveals the store-space on the Gang's west side. 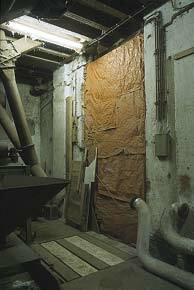 The originator of this living-space blocked the wall's east conveyor-path gap with a wooden wall faced on both sides with street-found carpet and, on its outside, with orange plastic ?sacks. 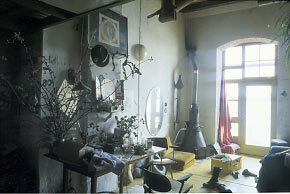 The originator of this living-space built his apt's facade from thick wooden planks and a domestic scrap 'front-door'. 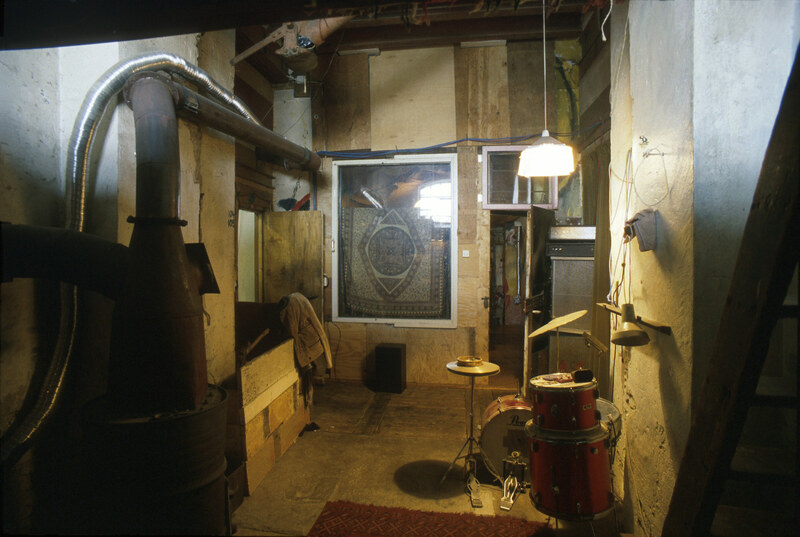 Huub's additions are its covering of street-found carpet; the door's dynamic wallpaper and accompanying ironic chute 'column'; a Bauhaus exhibition poster 'window view-in' (Huub is a designer) with its accompanying unruly geometric chutes. 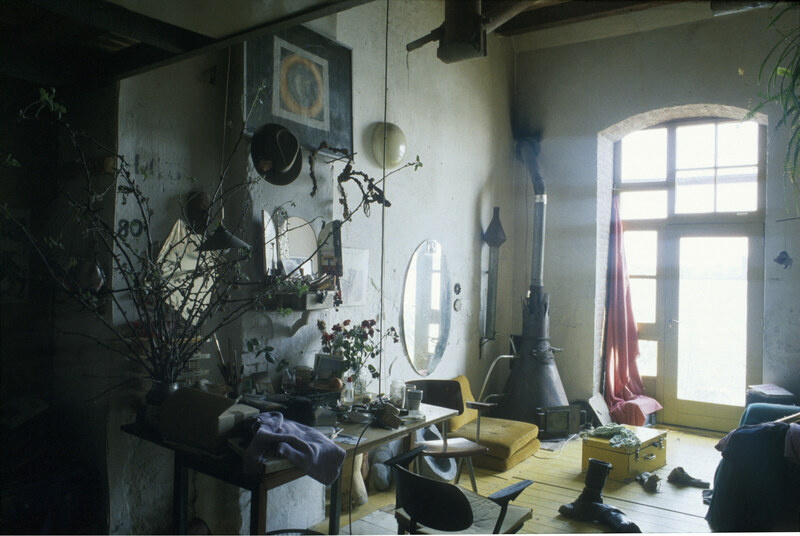 A strange ensemble! Beside and under the table are thick white painted planks blocking the east conveyor's wall-gap and floor-trough.